I was delighted when I received a copy of BBC Good Food magazine from my mom when she briefly passed through London. Bored and stranded at the airport, she saw this fun food magazine and the inventive recipes inside. I skimmed it quick and spotted a lot of cool, non-traditional ideas that I couldn't wait to try. One of these included a recipe for potatoes, stuffed with the most imaginative ingredients. It was cool to read about a different spin on this simple food, and as soon as I saw the hummus, roasted red pepper and arugula permutation, I had to try it. Making this dish was relatively fast and easy, and since potatoes are one starchy veggie, it was also very satisfying. 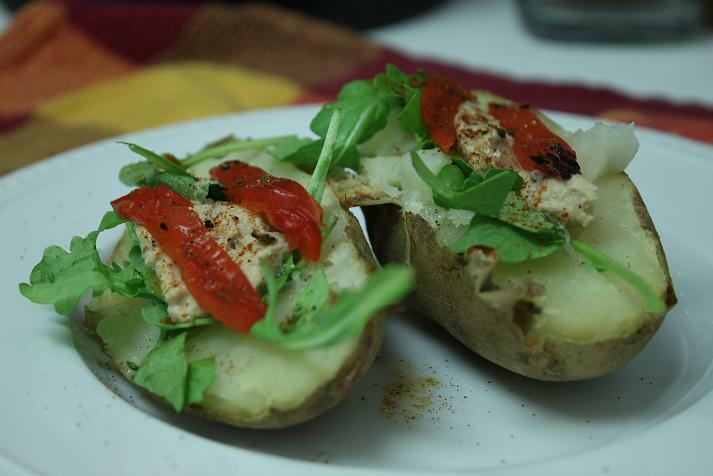 While the ingredients and the construction for this fancy potato is anything but, just make sure you use great quality ingredients that will shine in the potato. And sometimes it's OK to pay a little extra for good ingredients. Bake potatoes for about 45 minutes on 350 degrees or until tender. Slice in half and scoop out some of its flesh (but not all of it). Fill with arugula, roasted red pepper strips and the hummus. Finish with a squeeze of lemon juice, salt and pepper and a pinch of paprika. Sounds quite simple. It could be good as an appetizer for a Thanksgiving dinner or any dinner.